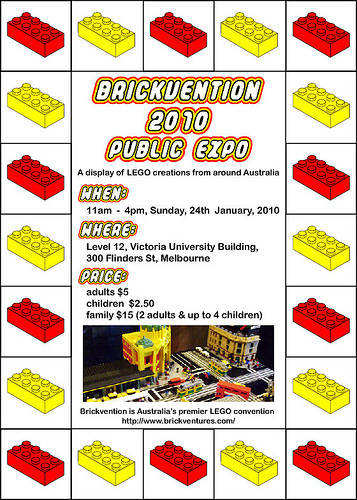 Registration is now open for Brickvention 2010, the Australian LEGO convention put on by Brickventures. I attended last year’s Brickvention and it was an impressive display. The public crowd on the Sunday was ridiculously huge. I’ll be there and I hope more of our readers can attend. Brickvention is an annual convention and exhibition of LEGO® brand building bricks presented by adult hobbyists from around the Australia. Brickvention 2010 will be held over the weekend just prior to the Australia Day Holiday (January 23rd – 24th) in Melbourne, Australia and promises to be an exciting event. Join us to view hundreds of models created by LEGO® Builders from around the nation. Build with LEGO® parts at our Building Zone. Purchase LEGO® sets, parts and minifigs. Similar to previous Brickventions, this year’s event will feature presentations, games, competitions, trading, and of course models by LEGO® fans from all over Australia. With much so more space available, the 2010 Brickvention promises to be even bigger and better than previous years!